The search functionality of SharePoint Online, , one of the Office 365 suite of products, is very robust and brings a Google or Bing-type experience to the corporate documents. Search is one of those things that doesn’t seem important until you really need to find something. You may vaguely remember seeing a presentation done by your colleague a few months ago but have no idea where to even start to look for it in the shared folder. You could e-mail him, but what if he is not available and you need it right away. Search solves the problem of needing to find specific information in a sea of digital data. 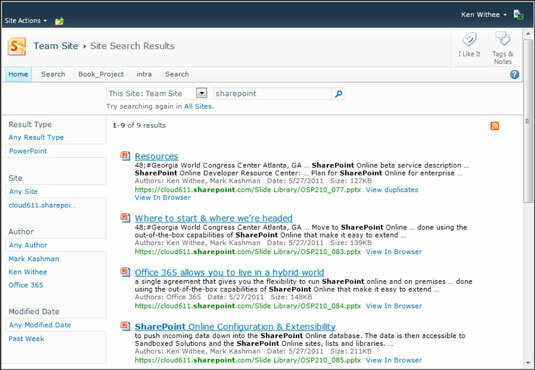 SharePoint Online includes the ability to search across multiple sites. As your organization grows and you have an increasing number of sites, it would sure be a pain to have to navigate to each site in order to perform your search. With SharePoint Online, you can search in a single location and the search will span across multiple sites. Sometimes, it can be difficult to get the exact terminology just right to return the content for which you are searching. SharePoint Online includes the ability to refine a search based on a number of configurable refiners. For example, you might be searching for that presentation that Bob presented to a client a while back. You type in the search term “onboarding employees” but receive hundreds of pages of content back. You remember that the presentation was a PowerPoint presentation so you narrow the search to only PowerPoint slides. You still do not see the presentation right away, so you narrow the search down again farther to only those presentations where Bob was the author. Bingo! The presentation you were looking for is right at the top of the list. Use the refiners to narrow a search. You can think of a search refiner as a filter. Your search for a broad topic might return hundreds of possible results. The refiner allows you to filter this information down based on the configured criteria. Another key aspect of search is finding someone you just met but are not sure how to spell his name. For example, you might meet a co-worker in the hall and he mumbles to you that his name is Kain. You register the name as Kain but when you go to search for him online, you wouldn’t normally find him if you type in Kain because his name is actually Ken. SharePoint phonetic search allows you to still type Kain and SharePoint recognizes that this is phonetically very similar to Ken. SharePoint is smart enough to show Ken in the search results. Because SharePoint also shows Ken’s mug shot, or company profile picture, in the search results, you can see that you have found the right person you just met in the hall. In addition to Search, SharePoint also includes business intelligence functionality and the ability to develop business solutions without writing a single line of code. Business intelligence covers such things as reports, scorecards, dashboards, and key performance indicators. Business intelligence features in SharePoint fall into a marketing bucket called Insights. All the nifty tools and features that provide business users with the ability to create applications without programming are called Composites. These aspects of SharePoint require their own books, but for now you should know that they are important pieces that make SharePoint so valuable.